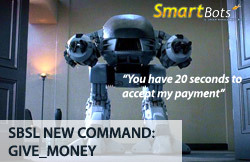 A new command for SBSL (SmartBots Bot Scripting Language) has been published: give_money. This command allows sending money to other avatars from your SBSL scripts (for example, within a role-playing scenario or access control system). You can find the give_money command syntax in SmartBots SBSL documentation. The following example shows how to process payments in most simple way: returning them back immediately.